Toyota's latest recall involves more than half of the Prius vehicles ever sold. TOKYO (Bloomberg) -- Toyota Motor Corp. will recall more than half of the Prius vehicles ever sold to fix a software glitch that could slow down or bring the car to a halt. The recall involves about 1.9 million vehicles produced globally since March 2009, spokesman Brian Lyons said. As of last year, worldwide deliveries of the Prius line of vehicles exceeded 3.6 million units since its release in 1997, according to the company. A flaw with the software in the Prius's hybrid system may cause some parts to overheat in certain driving situations such as accelerating from a stop, Lyons said. This can lead to the car entering a failsafe mode, where it can still be driven while at reduced power. In limited cases, the hybrid system could shut down and cause the vehicle to stop. Toyota hasn't received any reports of accidents or injuries related to the software problem, Lyons said. While the top seller of hybrid cars is headed for record profit this fiscal year, driven by the weaker yen, Toyota continues to face recalls that have damaged its reputation as a quality leader. The company called back more vehicles than any automaker in the United States in each of the last two years, according to the National Highway Traffic Safety Administration. "My impression is Toyota is recalling more often, even with very minor flaws" with its vehicles, said Yuuki Sakurai, the Tokyo-based president of Fukoku Capital Management Inc. "Toyota learned its lesson from the big recalls in 2009 and 2010." President Akio Toyoda has spent years trying to restore his company's quality standing after recalling more than 10 million vehicles for problems related to unintended acceleration in 2009 and 2010. The 56-year-old grandson of Toyota's founder hasn't announced any new car plants since January 2012 to avoid a repeat of over-expansion that he said was to blame for those recalls. 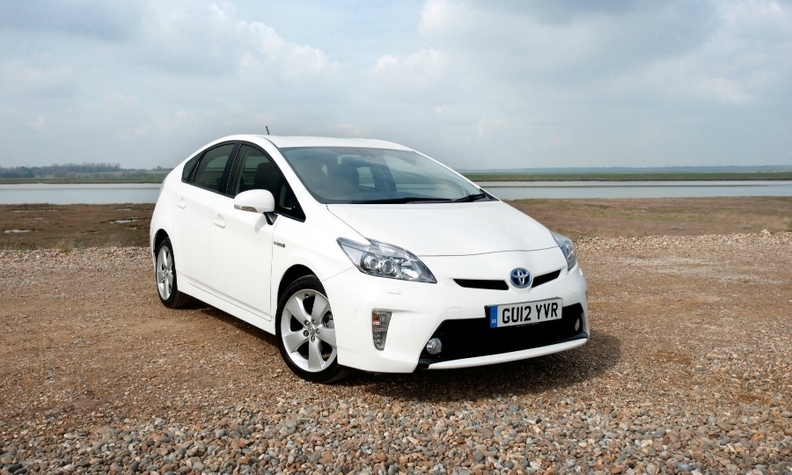 Toyota has been the auto industry's hybrid leader, having built three generations of the main Prius model and adding derivatives such as the Alpha wagon, also known as the v, since 2011. The recall announced today involves only the third generation of the main Prius model, Lyons said. Aside from the Prius, Toyota said it will recall about 260,000 other vehicles in the U.S. That campaign involves a separate issue with the 2012 and 2013 model years of the Toyota Tacoma pickup, the Lexus RX 350 SUV and the 2012 Toyota RAV4 SUV. A software issue with those models can cause their stability, anti-lock braking and traction controls to intermittently turn off, though the standard braking operation in those vehicles would remain fully functional, according to a statement on the company's U.S. Web site. The recall follows Toyota forecasting that profit for the year ending March 31 will surge to a record 1.9 trillion yen ($18.5 billion). The company has set a target of selling an unprecedented 10.32 million vehicles in 2014 after leading General Motors Co. and Volkswagen Group in global deliveries for a second straight year in 2013. Worldwide deliveries for Toyota, including those of subsidiaries Hino Motors Ltd. and Daihatsu Motor Co., rose 2 percent to 9.98 million units last year. Volkswagen and its MAN SE and Scania AB heavy-truck units followed with 9.73 million sales, the German carmaker said last month. GM was third in the industry with 9.71 million. Toyota isn't alone in emphasizing quality. U.S. automakers including GM are cracking Japanese brands' dominance in fielding cars with leading quality and reliability, Consumer Reports said last year. While models from Toyota and Honda Motor Co. held the top three spots in the magazine's annual auto-reliability survey released in October, GM's GMC and Buick posted gains and Volkswagen's Audi luxury brand made the top five.